I had hoped to post something last Friday, but last Thursday's evacuation of my neighborhood in Calgary has made that impossible. Since the evacuation, I've been putting together a post on what's been going on in this city-turned-waterpark. On Thursday, my partner Heather came home early from work so that we could pack some things "just in case" there was an evacuation. She is always poised to deal with disaster, so I went along with the plan thinking that we'd be unpacking toiletries and pajamas in an hour or so. 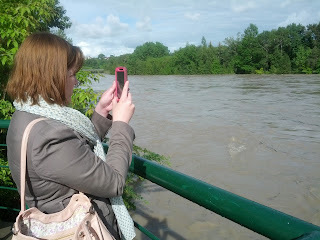 Then we decided to check out the rising river to get some pics. To be honest, those pics are no longer all that impressive compared to the stream of photos and videos that were shown on Global News. So I'll just share this picture of Heather throwing caution (the city hadn't issued a mandatory evacuation notice yet) to the breeze and snapping some pics. As we strolled back from the river we noticed something disconcerting: the two puddles that were on either side of the street as we went to the river had now merged to form a small lake in the middle of the street. We also noticed that water gushing from another storm drain was flowing uphill toward our home. Worries stemming from these sights were exacerbated when, toward the end of our survey around the perimeter of our home, we saw this flooded street a block from our apartment. I didn't take this picture, but I do take some credit as it wouldn't have been possible had I not fended off a plague of mosquitoes that were menacing Heather. After seeing that, we went straight home and found out about the mandatory evacuation that had been issued for our neighbourhood. Unlike the rest of our neighbours, we had our essentials packed, so we headed for the LRT station immediately. Passengers must have thought we were hysterical as they were passing info about the imminent flood casually as part of their after-work commute while we were huddled together on a seat--crowded by our dearest possessions--and comforting our puppy. Percy was mixed about the train ride. He didn't like the speed, but he loved the opportunity to greet people as they came aboard after work. I think that he was born for a career as a host. He didn't, however, appreciate the next leg of the journey: immediately after his first train ride, he had to board the escalator or, as he perceived it, a stampeding staircase. After the flood-induced hurly-burly was done, Percy was able to relax over a pint at the home of a relative that was kind enough to accommodate us indefinitely. 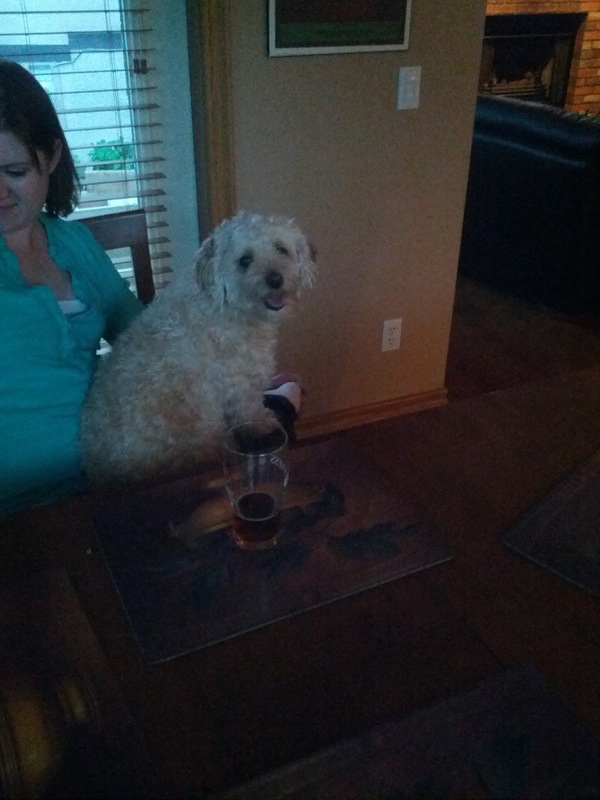 "I don't always abandon my worldly possessions to a deluge of unknown proportions, but when I do, I chase my trauma with Big Rock's Traditional Ale." As we tried to settle in to life as first-world refugees, we were worried by reporters that the worst of the flood was yet to come, and there was no telling the extent of the impending damage nor the length of the crisis. 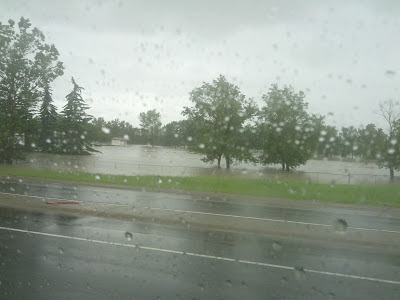 The Bow River wasn't expected to peak until around 3 or 4 AM, and the reports before we went to sleep was that the river had flooded the Saddledome and other areas further from the banks than ours. 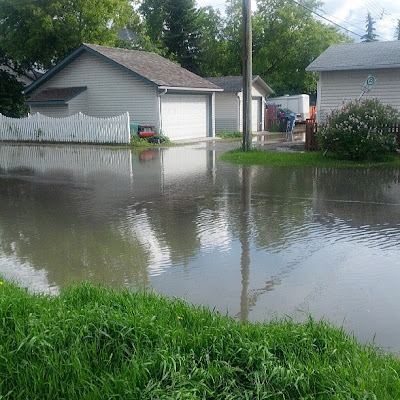 The stressful aspect of this situation was having to consider all possible outcomes between dealing with a bit of silt on the floor of our apartment to accepting that our basement unit had been flooded from floor to ceiling. It would have, strangely enough, been easier at that time to accept that everything had been washed away. We had reconciled ourselves to the loss, but the idea of having to throw out soggy, mud-caked memories seemed unbearable. The other problem was that we had no idea when we would be able to return. Had we known exactly when we could return and what the damage would be, we would have been able to accept it and bide our time more easily. Not knowing these details drew out every moment of the experience by putting our imaginations on the rack. The sound of rain as we tried to sleep that night only made our worries grow. The next day we saw some aerial photos courtesy of Global News. Our neighborhood was almost completely flooded except for a little strip that looked familiar to us. We decided to disregard the evacuation notice and return to our place to survey the damage and perhaps get some more things out. The drive back (in the pouring rain) was tense! 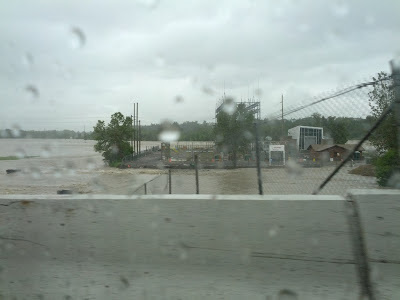 The city made it seem that the river was waiting outside our homes to sweep us away if we dared to leave. We didn't get ambushed by the river as we left, but the drive was still an intense experience because the river was creeping closer and closer to the road, and it had commandeered many parts of the city. This, for instance, used to be a golf course. When we arrived back home, we were happy to see that the river had stopped about a block and a half away from our doorstep. We did, however, have a problem as a clogged drain resulted in our parking lot becoming flooded with rain water. As we entered the basement, we saw that the outside door had become a fountain spouting water toward our home. With the help of our neighbour, who refused the evacuation notice, we cleaned up the area and began to pack. 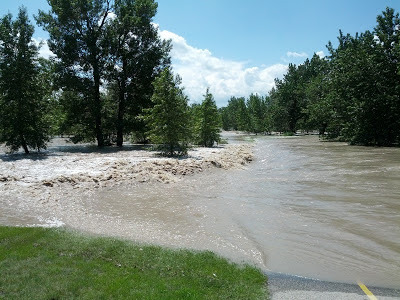 Even though it looked like the river wouldn't make it to our doorstep, and that the worst damage would be caused by clogged storm drains and backed-up sewers, we feverishly packed as much as we could and stacked everything else high up. Luckily for us, it turned out to be unnecessary, but we'd never been refugees before. After putting out-of-print books in safe places, packing extra clothes and dog toys, and, of course, stuffing our bags with Leafs paraphernalia, we left again. Even though we felt relieved about our personal situation, the ride back was still scary. This used to be a power plant. There was no sign that we'd be able to return the next day, so we decided to take a look around the area. It turned out that our new location was about a kilometre from the river, but we were elevated, so there was little concern about being forced to evacuate again. 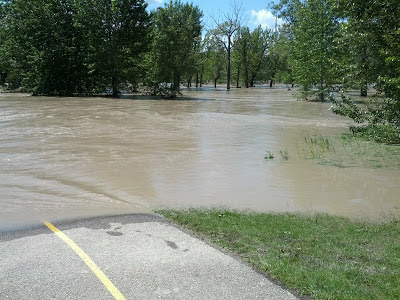 Apparently the Bow River hates bicycle paths as much as some motorists. 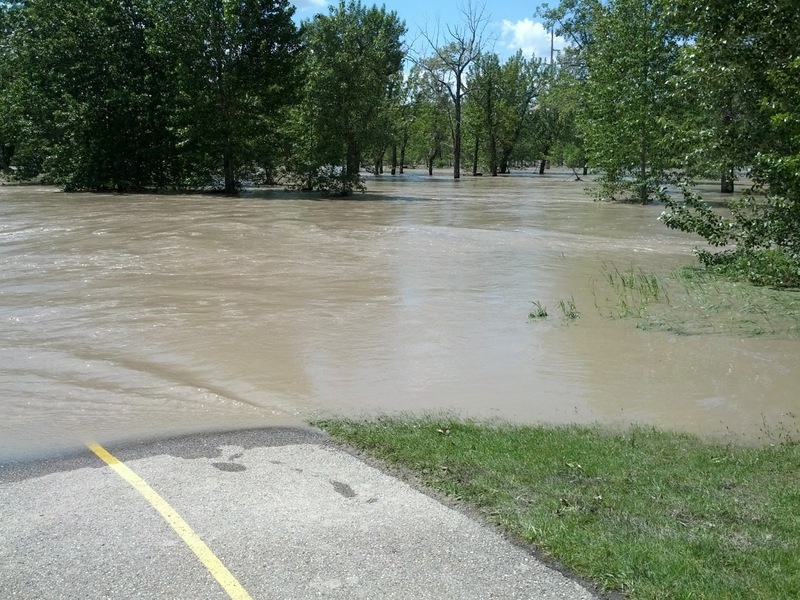 The river should be about 500m away from here, but apparently it decided to take a stroll through this lovely park. 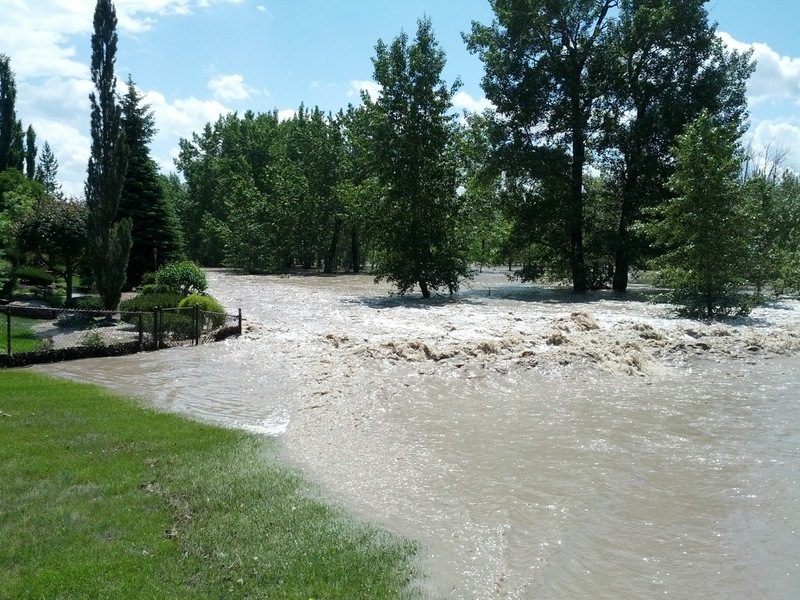 The person who bought this property probably didn't plan on it being a river-front home. 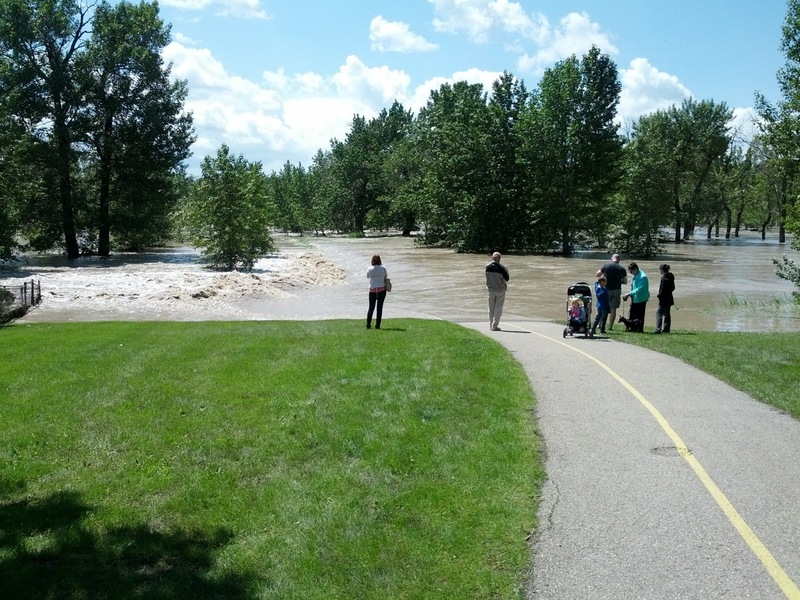 Checking out the flood became the most popular pastime among Calgarians last weekend. Luckily for us, we were allowed to return home the following day. Upon returning, we found our place even drier than when we last saw it. We are extremely fortunate not to have any damage to our place (aside from a musty smell) considering that the neighbourhood last night was filled with the sound of sump pumps, and the streets were flooded with water returning to the river. Less than three blocks from us were rows of houses in which a jungle of hoses were sprawling into the streets and spewing forth remnants of the river left behind by the flood's recession.